There is a space between follow and up under one condition—you are using follow up as a verb. To follow up means to gather further information or to reinforce or evaluate a previous action. Those who work in the medical field often use this phrase with patients: The doctor will call you to follow up after the surgery to see how you are recovering. Does that mean followup and follow-up are wrong? No, because follow up functions only as a verb. But you might find yourself needing to talk about the act of following up. For example, a news reporter might present a story that gives further information or reports the conclusion of a prior report. The second piece would be a follow-up to the first. Parents might call the school to make sure that their children’s grades are improving after they hire a tutor. They may schedule a follow-up with the teacher. If you use the expression in this way, it functions as a noun. A few dictionaries, such as the American Heritage Dictionary of the English Language, list followup, written as one word, as an alternative to follow-up with a hyphen. However, others such as Merriam-Webster list only follow-up as standard. As an adjective, follow-up means intended as a response, a reaction, an evaluation, or a reinforcement of a previous action. For instance, you may be called for a follow-up interview if you did well on your first-round interview, or you may receive a follow-up letter if you write a letter of complaint to a company. In medicine, it specifically refers to an examination to monitor previously administered treatment. 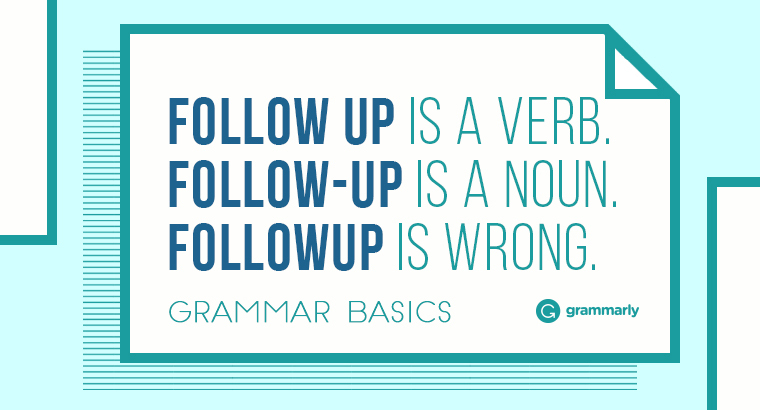 If you are using follow up as a verb, there is a space between the two words. If you are using it as a noun or adjective, put a hyphen between the two words: follow-up. Some write it together as one word, but that practice is not standard. Ford took his time putting together his follow-up, the dreamy, non-linear Nocturnal Animals—but, as he pointed out to Vanity Fair senior west coast editor Krista Smith at this year’s Toronto Film Festival, he hasn’t exactly been idle. In the follow-up study, a team of researchers led by Conny Vrieling, MD, PhD, of the Clinique des Grangettes, Switzerland, sought to reanalyze the prognostic factors related with breast cancer recurrence in a long-term follow-up of the EORCT boost no boost trial. What’s the right way to write the expression—followup, follow-up, or follow up? The answer is in the details. If you are using the phrase as a verb, your only option is to add a space between follow and up. If you are using the expression as a noun or an adjective, you can choose the universally accepted follow-up or take a chance on followup. In fact, you might want to follow up on followup by keeping an eye on new editions of your favorite dictionary. It just may be coming soon.